After two straight wins against Sacramento City College to start its conference schedule on March 10 and March 12, American River College’s baseball team (10-11 overall, 2-4 conference) has lost four games in a row, including being swept in a three game series last week against undefeated San Joaquin Delta College. The team fell in the final matchup of three games against Sac City on March 14, which snapped a seven game road winning streak. ARC played two of three games at home against SJDC, keeping close in an 8-5 loss and falling just short of coming back in Saturday’s game. In last Thursday’s matchup, ARC was out right from the start in a 10-1 blowout loss. Outside of Matt Gunter, (5-2, 2.79 ERA), ARC’s pitching has struggled mightily, with only Kirby Broadbent and Christian Savage holding ERA’s under four. The team’s offense has also been slow of late, failing to score in the first three innings of every game in the series against SJDC. Five members of the team, Alex Gaskin, Colton Freeman, Dalton Devries, Cameron Bennett and Broadbent hold batting averages over .300 despite the overall recent struggles of the team, led by Broadbent’s .359. The team now turns its attention to Cosumnes River College, playing at 2:30 p.m. today at CRC. CRC has also lost four straight coming into the series, and holds an identical 2-4 conference record. While the offense has put up decent numbers in recent games, the team has left a glaring 25 runners on base in the midst of its losing streak, including eight stranded in Saturday’s 5-4 loss. Starting left fielder Jimmy Lunardelli was struck in the forearm by a pitch in the fourth inning of Saturday’s game, in obvious pain immediately after being hit. 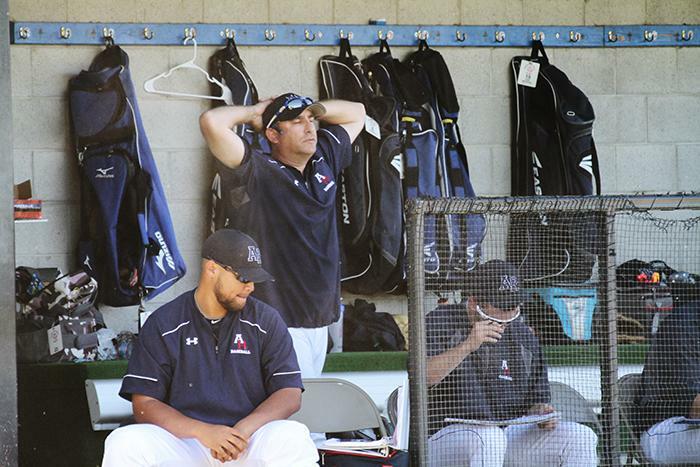 Lunardelli was checked by several members of the coaching staff and ARC’s athletic trainers, and was taken out of the game and replaced by James Boitano to start the fifth inning. Lunardelli will be in a brace for about a week but no fracture was detected from X-Rays, according to head coach Doug Jumelet. Losing Lunardelli could be significant for ARC as he leads the team with 10 extra base hits and is hitting .284 this season. Be the first to comment on "Notebook: Team mired in losing streak during brutal stretch of schedule"